An essential building block for the neurotransmitter DA , L-Phenylalanine is an essential amino acid that can be found in protein-rich foods like meat, eggs, spinach and other leafy greens. 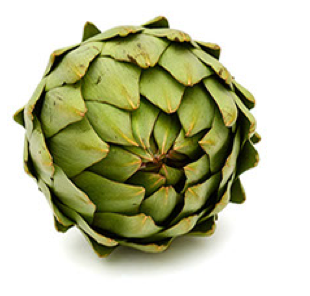 Vitamin B6 is an essential vitamin and an important enzymatic cofactor in normal metabolic and psychological function. CILTEP features the metabolically active form of Vitamin B6 for optimal bioavailability (Pyridoxal-5-Phosphate). An essential building block for the neurotransmitter DA, L-Phenylalanine is an essential amino acid that can be found in protein-rich foods like meat, eggs, spinach and other leafy greens. CILTEP® is a natural supplement that helps the user achieve a high state of focus and concentration and enhanced memory formation. 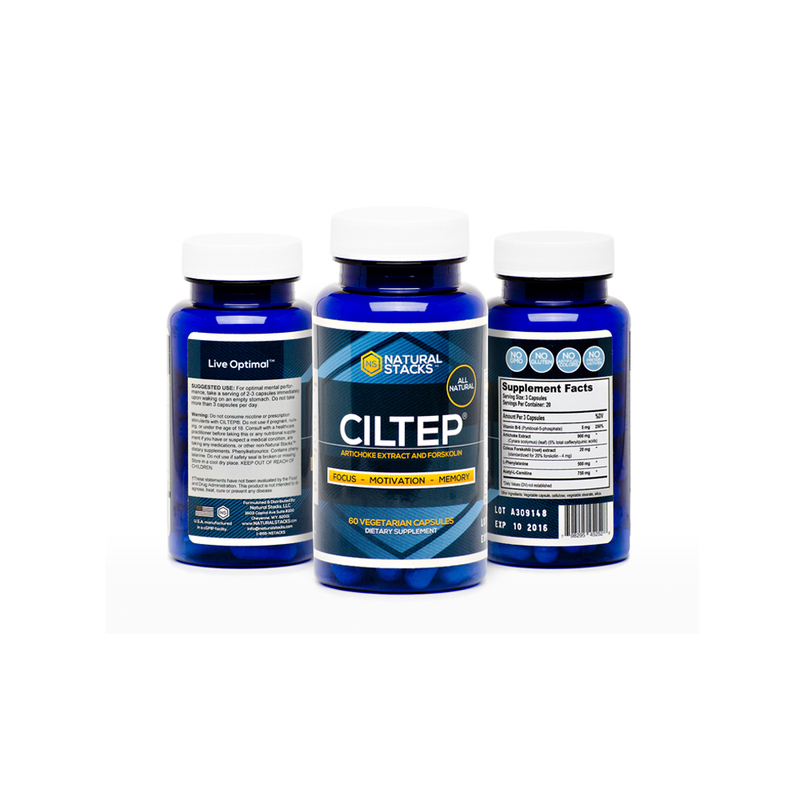 CILTEP® is designed to induce long-term potentiation (LTP) in the brain, which is a crucial mechanism involved in the formation of new memories and the strengthening of neural synapses in the brain. We suggest taking CILTEP first thing in the morning on days that include demanding cognitive tasks. Take it on an empty stomach and 20-30 minutes later, you eat breakfast or – our favorite, have some bulletproof coffee for an extra spark. 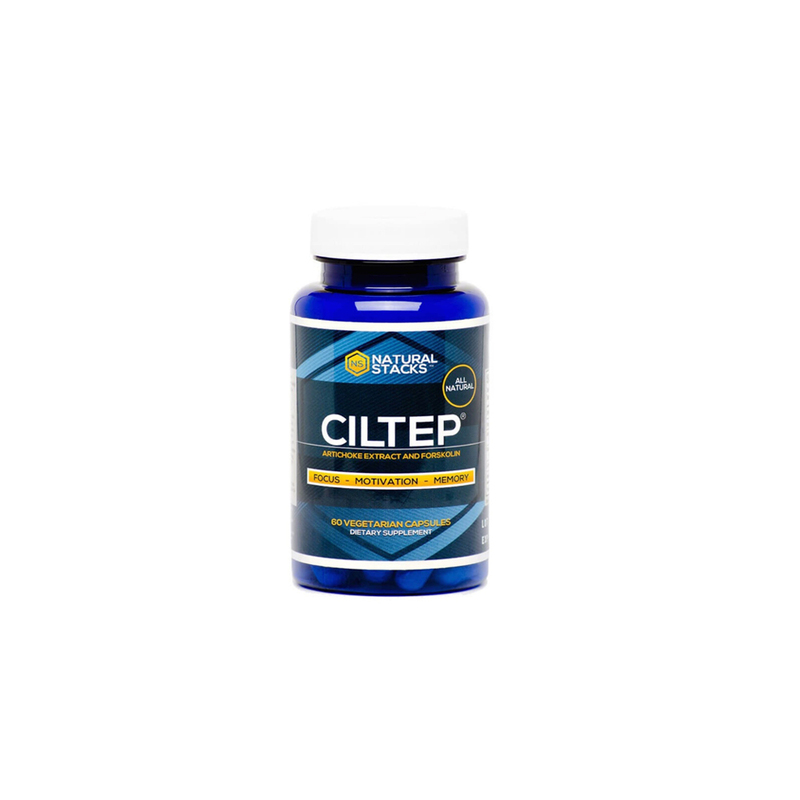 CILTEP increases focus and potentiates long-term memory but doesn’t rely on neurotransmitter manipulation to elicit this benefit. Because CILTEP is not a stimulant and it doesn’t directly impact our neurotransmitters, the “feel” is very subtle. 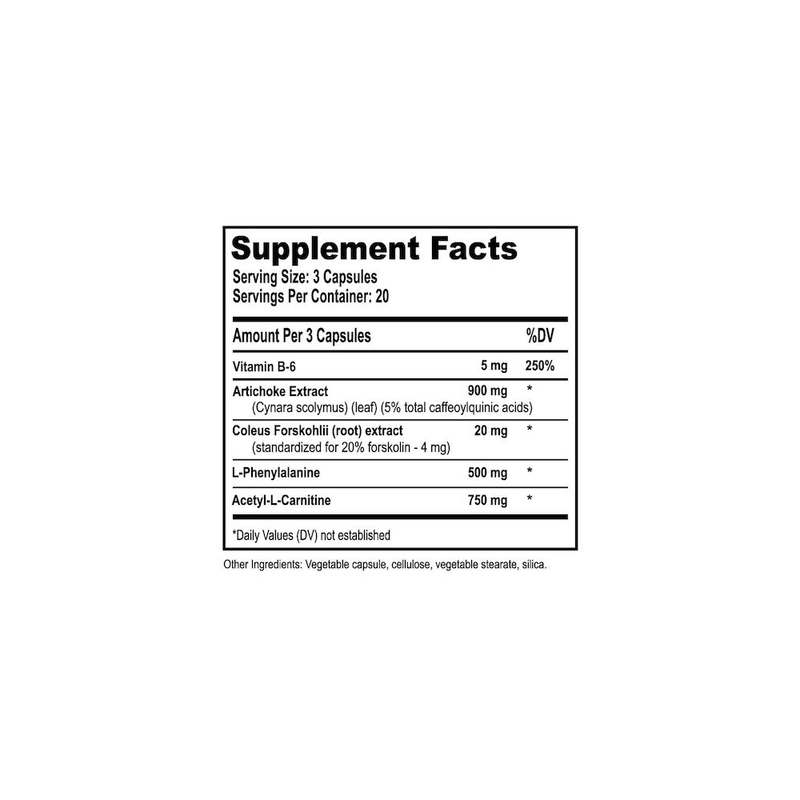 CILTEP is a natural nutritional supplement designed for improving and maintaining brain performance. It’s theorized to improve learning and memory in the brain by supporting and optimizing levels of intracellular secondary messengers. Reneerkens OAH, Rutten K, Steinbusch HWM, Blokland A, Prickaerts J. A promising target for cognition enhancement. Psychopharmacology. 2009;202(1-3):419-443. doi:10.1007/s00213-008-1273-x. Lelkes Z. Pharmacol Biochem Behav. 1998 Aug;60(4):835-9. Block F1. Neuroreport. 2001 May 25;12(7):1507-11. Chen RW. Neurosci Lett. 2007 May 17;418(2):165-9. Epub 2007 Mar 18. Broadley KJ (March 2010). Pharmacol. Ther. 125 (3): 363–375. doi:10.1016/j.pharmthera.2009.11.005. PMID 19948186. Lindemann L, Hoener MC (May 2005). “A renaissance in trace amines inspired by a novel GPCR family”. Trends Pharmacol. Sci. 26 (5): 274–281. doi:10.1016/j.tips.2005.03.007. PMID 15860375. Inano A1. Acetyl-L-carnitine permeability across the blood-brain barrier and involvement of carnitine transporter OCTN2. Biopharm Drug Dispos. 2003 Nov;24(8):357-65. Scafidi S, Fiskum G, Lindauer SL, et al. Metabolism of acetyl-L-carnitine for energy and neurotransmitter synthesis in the immature rat brain. Journal of neurochemistry. 2010;114(3):820-831. doi:10.1111/j.1471-4159.2010.06807.x. Pettegrew, JW. Molecular Pyschiatry. Nov. 2000, Volume 5, Number 6, Pages 616-632. Cooke SF. Plasticity in the human central nervous system. Brain. 2006 Jul;129(Pt 7):1659-73. Epub 2006 May 3. Bliss TV1. A synaptic model of memory: long-term potentiation in the hippocampus. Nature. 1993 Jan 7;361(6407):31-9. Curtin BF. Forskolin, an inducer of cAMP, up-regulates acetylcholinesterase expression. Mol Cell Biochem. 2006 Oct;290(1-2):23-32. Epub 2006 Aug 19. Guilarte TR. Neurochem Res. 1989 Jun;14(6):571-8. White HL. Acetyl-L-carnitine as a precursor of acetylcholine. Neurochem Res. 1990 Jun;15(6):597-601. Much more mental clarity and recall on this! I feel much more functional on this than i ever did on Provigil, Adderall or Vyvanse. No drop off or palpations either. highly recommend ???? There is a HUGE DIFFERENCE in my mood, productivity, and energy levels with taking this product as opposed to just a cup of coffee in the morning. My energy level is sustained throughout the day, as well as a clear thought process (no brain fog), and motivation to keep tackling tasks. My mood has also improved to the point where I feel less stressed regardless of daily challenges, and I’m more ‘present’ with my family during downtime after a long hard day. I haven’t experienced any negative side effects at all, and will keep using this product in conjunction with my bulletproof coffee and lifestyle. Immediate results no kidding. I have more energy now and it’s needed with my little ones. The evening has become enjoyable due to my sustained energy without drinking more then ONE cup a day. Water and tea are my only drinks. Really impressed with this product and I’ve already recommended it to friends. A secret that should be shared. No more brain fog! Bring on the day…. This product is incredible! I am so much more motivated and I get so much more accomplished in a day whenever I take this product. CILTEP is a MUST HAVE! I gave CILTEP a go and I did like it. 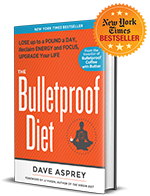 I noticed a significant boost taking CILTEP right out of bed and in combination with Bulletproof coffee. I like to write in the morning and CILTEP helped me quickly get in a Flow State. I didn’t use it every day, just days I knew I had the time to write. Over time the effect definitely dwindled. So I took some time off after finishing the first bottle before ordering the next one. Going to evaluate the effects again on this second go around. “I use CILTEP to run deep in poker tournaments!